They told us about a river we could probably camp along, and after we said our goodbyes we trekked a mile or so down to its banks. We hiked along the river for a while and had made our usual dinner of rice and tuna when we noticed that the other side of the river would be a much better camping locale. After eating, we loaded up our packs and started heading towards a bridge we could use to get to the other side. It was there that we were approached by two younger guys on bikes which were loaded to the gills with equipment. “Hey, do you guys speak English?” one of them asked. We were surprised that they did- “Yea man we’re from the US, what about you guys? “We’re looking for the same thing. I think the other side of the river looks a little better, but there’s a few decent spots further down as well,” one of us answered. They pedaled away and we shouldered our packs to cross the bridge. Morale was definitely raised that night, as the river was undeniably beautiful–a perfect color which reminded me of robins-egg blue–and the sound of it passing muted highway noises for the first time in a few days. We slept great and were even able to wash some of our clothes–and ourselves–in the river before leaving the next day. After hiking back up the mountain into town, we set up in front of a gas station to try to get another ride further south. We had killed a lot of the day finishing our washing as well as making the hike back up from the river so it was getting rather late in the day when we started hitchhiking. Before long though, a young girl in a Fiat Panda pulled over. There was a dog riding shotgun with her. We somehow (I’m still not entirely sure how it was managed) were able to fit all of our packs, instruments and this DOG into the little car. She taught me my first words of Italian, which ironically enough, were “Do you speak English?” and laughed when I repeated it back to her, commenting that I had an accent which I believe she equated to an Italian southerner. I even sound like a hillbilly in Italian, I guess. We had driven for an hour or two, making quite a bit of distance (in hitchhiker’s terms) from Bellinzona Switzerland, almost into Italy. She told us that we wouldn’t have much luck hitching from the border towns to Milan, so after some convincing (we had heard people tell us things like that before) we finally relented and let her drop us off at a train station instead of a highway on-ramp. We snapped a picture with her and her dog and she was off on her way. We decided to have a little lunch before we headed into the train, and it was here that two familiar-looking guys pedaled up to us on bikes. “Dudes!” one of them shouted out, smiling. 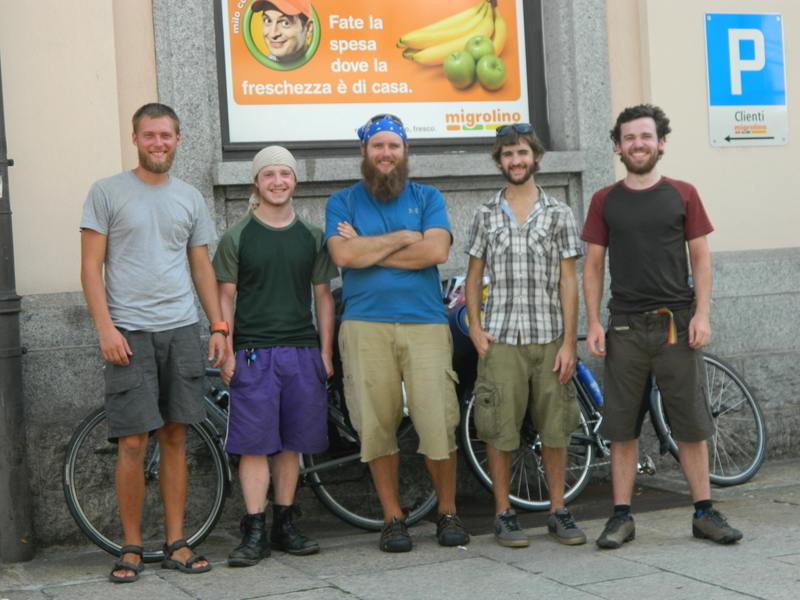 The same guys we had just seen the day before, miles and miles north-had somehow biked; randomly, to the same exact train station in the same exact town, at the same exact time we had arrived from hitchhiking. They obviously had gotten a much earlier start and had been riding all day. 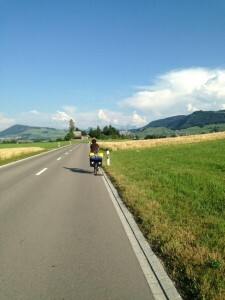 They had roughly the same amount of weight on their bikes as we did on our backs (around 30 kilograms; or 60 pounds). They had been averaging something like 40 to 50 miles a day if I remember correctly! I would die if I attempted this, I can’t stress that enough. 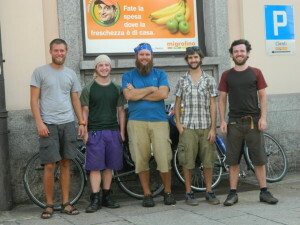 After talking for a while, we shared some Nutella and bread with them and headed into the train station as they biked on. It’s amazing the things you experience when traveling that you wouldn’t even think possible. What are the odds? Same train station, same city, same time with two entirely different modes of travel? The story of our week-long nonstop hitchhiking saga is a story in itself and will definitely be included in the novel I’m currently working on. I just thought I would share this particular tidbit after seeing this friend–who I later added on social media and have kept in contact with–post a picture of him on his bike, loaded down with gear; pedaling on some small forgotten road in Europe. Cheers Sam and Anderson; and bon viaggio!